With its insulation on the outside, CHIP (Compacted Hyper-Insulated Prototype) seems to have been a big draw at this year’s Solar Decathlon in Washington DC. 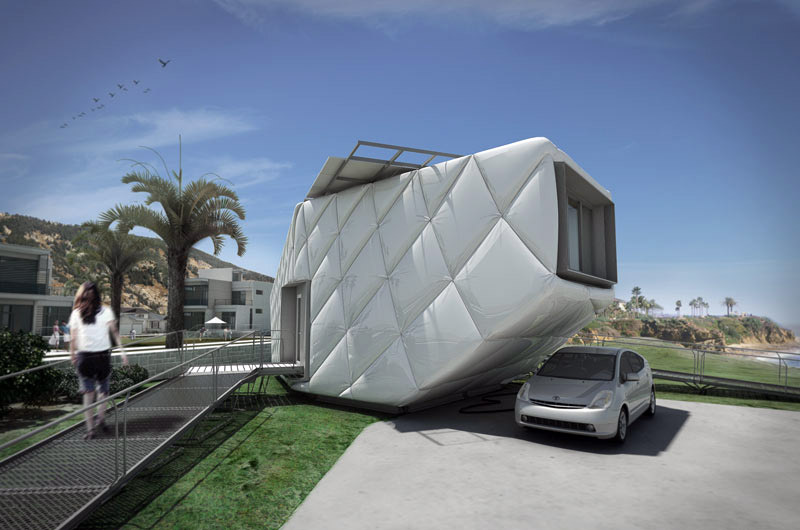 Designed by a team of over one hundred Sci-Arc and Caltech students, CHIP is a prefab, net-zero solar-powered house designed to challenge every architectural and engineering preconception regarding the net-zero-energy home. The house includes a full kitchen and bath, as well as an elevated platform as the sleeping area which also provides a nice view of the rest of the house, from above, and a view out the large window. Because the insulation is on the outside—which is apparently an inexpensive and effective way to blanket the house and keep it warm—the interior has its framing exposed and allows for many built-ins and furniture storage. This entry was posted in Architecture, Event, Just Plain Cool. Bookmark the permalink.